People are always asking me “What’s the market like right now?” So I thought, why not lookup some raw data from the MLS and share it with the people who do business with me. Because, if you’re like me at all, you don’t necessarily trust everything that comes out of media and/or advertising. 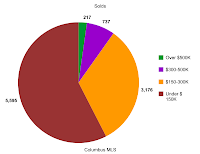 If this makes sense, no need to read the lingo: Homes for sale, being sold, and sold…broken down by price range…with pretty charts. What more could you ask for? 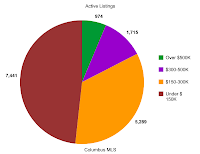 Active listings = Homes that are currently “on the market (aka. “For Sale”). Contingent = Homes that are “in contract, under contract, or contingent. Meaning, the home was for sale and is now in contract and set to close (sell) as long as the contingencies in the contract don’t blow the deal (inspection, appraisal, financing, etc). Sold = Homes that have sold during the past 6 months.